We have a collection of unique chandeliers from around the world. 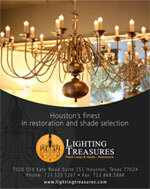 Lighting Treasures has fully restored and rewired many of these chandeliers to our unique specifications. We can customize your chandelier with many other features to suit your taste. Because of the large market we are in, we are getting new and exciting shipments all the time. Check back often because our chandelier inventory is constantly changing! We also carry the full line of Dana Creath Designs fixtures by catalog.